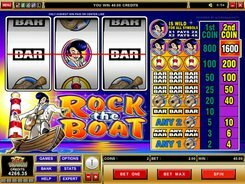 This 5-reel 9-payline game is part of a Microgaming’s series of slots that are identical in functionality but differ in theme and appearance. 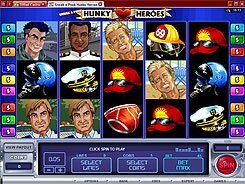 The slot will definitely resonate with female audiences since the symbols depict attractive strong men of heroic professions: a lifeguard, a pilot, a policeman, etc. 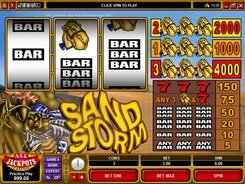 Before any spin you can adjust the number of coins (1–10), and a coin value (up to $0.25), so the maximum bet is $22.5, though economic players can opt to place as low as $0.09 and still have all lines enabled. 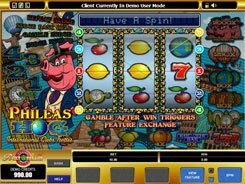 The slot has a wild, a scatter, free spins and an amazing Sneak a Peek feature. 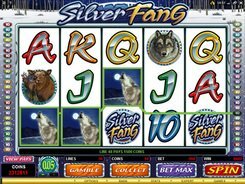 A wild (Red Heart) substitutes for other non-feature icons and pays out the top prize of $10,000, for five of a kind. In the Sneak a Peek feature you are to choose 12 of 15 squares on the scratch card, each revealing a piece of clothes. If you pick 3 identical pieces, the man will take off an item of clothing and awards you a cash prize. In this feature, you can grab a total of 12,000 coins if you are lucky enough. PLAY FOR REAL MONEY!